Nurse Keith's Digital Doorway: Book Review: "The Call of Nursing"
Book Review: "The Call of Nursing"
"The Call Of Nursing: Stories From the Front Line of Health Care" by William B. Patrick, is a timely and precious book that highlights the diverse voices of nurses employed in various aspects of an equally diverse profession. Created from a massive undertaking of in-depth interviews with its subjects, this book is a honorable transcription of nurses' spoken narratives onto the page. These stories are a moving testament to the power of nursing, and the continued power of storytelling in the 21st century. In the course of this worthy book, twenty-three nurses describe their work and the place that nursing holds in their personal and professional lives. From a New York-based wound care nurse to a maritime nurse employed on the USS Ponce to a hospice case manager in New Mexico, these nursing professionals wax both personal and poetic about their careers as nurses, the most trusted professionals in the United States. I don't think everybody is necessarily cut out for wound care. There can be a bit of the gross factor to it. All nurses have to be able to deal with bodily fluids to a certain extent, bout wound care can be extra smelly and slimy. In one case, I've had my hand inside somebody's chest cavity while they were awake and talking to me. In another, it was open-heart surgery gone awry, where the sternum didn't heal back together and everything was partly open. I love taking care of patients. It might sound funny, but I love the fact that I'm actually helping them. It's the paperwork and the other crap that might eventually drive me away from it. If you were to ask me, "Should I become a nurse?" I would say, "Yes", with no hesitation, but I would recommend being selective about what area you choose. There are good areas of nursing, but there are some where they'll just workyou to death. A lot of hospitals right now want their nurses to work longer hours for less money. Med-surg floor is a killer. Orthopedics floor, they'll break your back. L & D is still okay, but then you set yourself up for liability. A lot of nurses go into that because they want to take care of babies. I've delivered thirty-three babies in the backs of speeding ambulances, and I don't need to do that anymore. That young father's tumors were way too deep to remove. Right after diagnosis, he had undergone surgery, suffered through chemo, and finally had radiation treatments. Unfortunately, when they radiated that area, they had burnt the tissues, and the tumors were just coming through everywhere. Those were some of the most violent tumors I had ever seen, and I wanted to try some wound care. "Maybe I can do something to ease your discomfort," I told him. I knew I wasn't going to fix them. But he looked at me and said, "I can't tolerate that at all." I realized at that point he was close to the end. Even though my gut, as a nurse, said, I really should do something about these, I just had to realize that wasn't important. I had to make him comfortable and let him say goodbye to his kids. There is a great deal of writing in the marketplace about nursing and nurses, and a plethora of that writing is by nurses themselves. "The Call of Nursing" is another worthy addition to the canon of nursing stories that continues to deepen and broaden with time, and it is told by a writer who is not himself a nurse, but is clearly determined to communicate sympathetic yet unsentimental truths about the profession. Mr. Patrick began with 140 respondents willing to tell their stories during lengthy interviews, the field of nurses being eventually winnowed down to 23 extraordinarily ordinary---and ordinarily extraordinary---nurses. None of these nurses was paid a dime for what they contributed to this project, and there would be no book without their selfless generosity. And there would definitely be no book worth reading without their willingness to share the most compelling aspects and experiences of their careers. This is more than a book of health care stories, and far more than just excerpts from random conversations with people who are describing their specific occupational trenches. 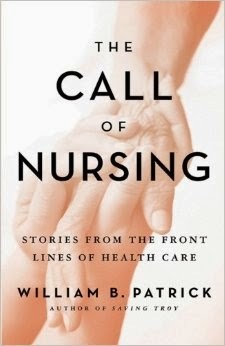 This is an anthology of hard-won wisdom, and I celebrate the courage of these nurses for offering their version of it. Thank you, Mr. Patrick. And thank you to the nurses who gave of themselves for these narratives to be transcribed to the page. This book is a gift, received with reverence and gratitude for the stories and realities it so movingly and accurately portrays for those of us willing to listen.